Lactase non-persistence seems to be more important in the south and east of Great Britain. George Davey Smith et al. Lactase persistence is an autosomal-dominant trait that is common in European-derived populations. A basic tendency for lactase persistence to increase from the southeast to the northwest across European populations has been noted, but such trends within countries have not been extensively studied. We genotyped the C/T-13910 variant (rs4988235) that constitutes the putatively causal allele for lactase persistence (T allele representing persistence) in a general population sample of 3344 women aged 60–79 years from 23 towns across Britain. 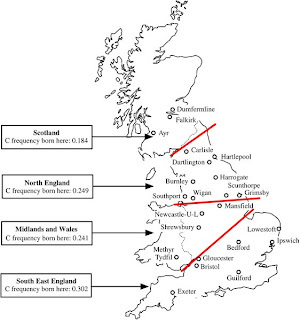 We found an overall frequency of 0.253 for the C (lactase non-persistence) allele, but with considerable gradients of decreasing frequency from the south to the north and from the east to the west of Britain for this allele. Daily sunlight was positively related to C (non-persistence) allele prevalence. However, sunlight exposure and latitude are strongly correlated, and it was not possible to identify which is the primary factor statistically underlying the distribution of lactase persistence. The C/T-13910 variant (rs4988235) was not related to drinking milk or bone health (although drinking milk itself was protective of bone health), and was essentially unrelated to a wide range of other lifestyle, health and demographic characteristics. One exception was general health being rated as being poor or fair, for which there was an odds ratio of 1.38 (1.04, 1.84) for women homozygous for the C allele; on adjustment for latitude and longitude of place of birth, this attenuated to 1.19 (0.87, 1.64). The lactase persistence variant could contribute to the examination of data for the existence of, and then statistical control for, population substructure in genetic association studies. I was tested for lactose intolerance as an infant,which is standard practice for newborns in many hospitals - results said I could tolerate it and drink milk. But ,my autosomal report from DNA tribes shows me matching Dubai United Arab Emirates and Africans only,as if I have NO EuropeanAncestry what so ever!But other DNA reports say I match European Haplogroups and I also have WheatIntolerance-Celiac Genes found primarily in Northern and Southern Caucasians Europeans. ? Daily sunlight means lactase non prevalence allele and then you'll feel poor,weakly? If they move into the shade will their offspring evolve lactase persistance and good health-or is there a reason for all these allele types? I seem to tolerate milk well,but my family never drinks it much-;I started drinking it as an adult,but wouldn't touch it as a kid,not unless it was all sugared up and I still occasionally put sugar in it,because it's bland.Like I said earlier I think I have Wheat-Intolerance and that messes up the intestional tract,so sometimes those affected can't drink dairy,be it lactose or casein.There was a time for a month when I had to drink Lactaid-lactose free milk or goat milk due to the wheat Intolerance in my gut,but those feelings went away then I went back to milk. (Goat milk doesn't seem to irritate me either-so sometimes it's Lactaid or goat milk that I need).I also started craving goat milk after I got Wheat Intolerance-now I love all things goat.Is that weird or what?I still eat beef ,though.